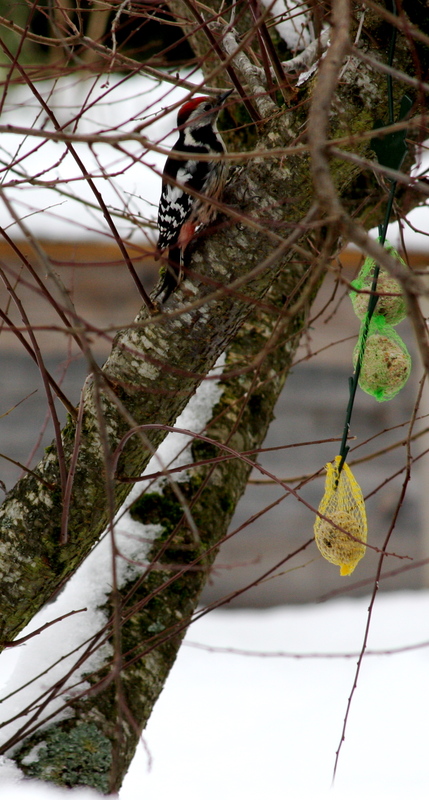 The nervous and elusive woodpecker above comes around noon every day to feed at one particular birdfeeder in my garden. It’s a greedy thing, and when it’s there, none of the other birds are allowed anywhere near. They gather in the plum tree branches, fluttering and impatient, while the woodpecker calmly eats its fill. I had wanted to get a picture of that from my office window, but the entire lot of them scattered every time I tried to crack the window and point the lens. 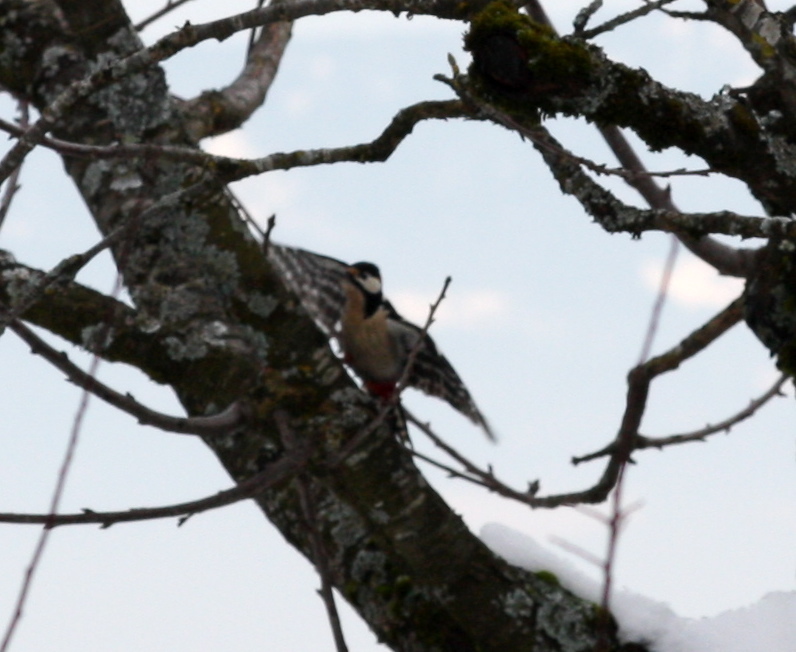 So I took a picture of the woodpecker in the cherry tree where it took refuge at the far end of the garden. A bit too far for my lens. And then I waited. After three attempts, I sat with the window open and waiting, camera poised, but the sneaky little devil didn’t return, so I closed the window again. The temperature is right around freezing today, my hands were getting too cold to type. A bit longer, and the woodpecker returned, but refused to feed while I was sitting there, so I left the room, and then snuck back in and cracked open the window for a shot. This was the best I could do once it saw me again. All I really wanted to do was say how I admire the various birds for being able to eat in any position, including upside down. And maybe show the whole flock of perhaps five different species hovering around while the woodpecker took its time at the feeder. Oh well. At least this little guy wasn’t bothered by the sound of the window or the clicking of the camera. 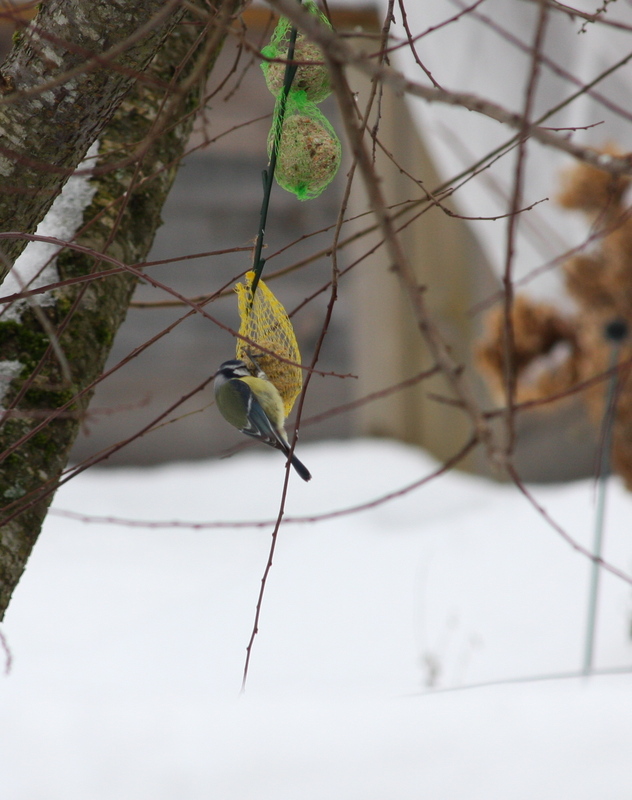 And for once, he had the birdseed to himself.